I was part of a small contingent of boys who cycled from various parts of the city and stored our bicycles in the left luggage office at Cambridge station. We usually caught the 8.02am train to Ely, or the 8.12 if we missed it. All in the good old age of steam - the 8.12 had a corridor, the 8.02 didn’t. For the first couple of years, we caught a connection on to Soham, followed by a fifteen minute walk to school. When the branch to Soham closed to passengers, we boarded one of the buses from Ely. I have a photograph of a group of us on the train. 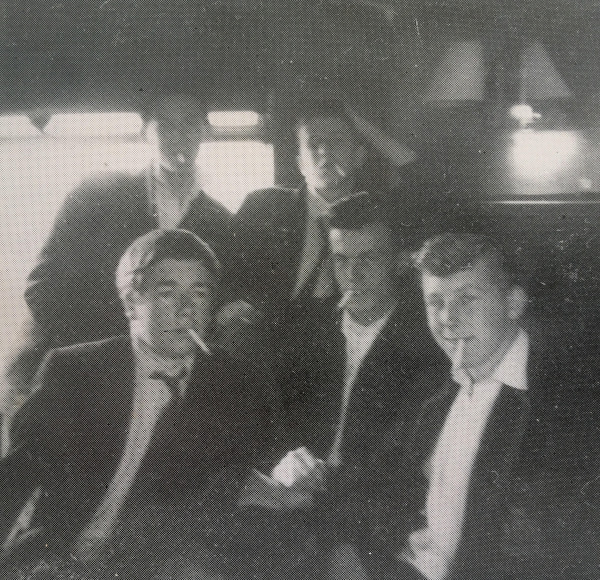 On the train from Ely to Cambridge (circa 1959). Front row Roger Dibbs (55) Vince Driver (55) Michael Clark (55). I think the two in the background are Roger Ogden (56) and John? Rutherford. At the moment I don't recall who took the photo. My social life centred around Ely, as we could use our season tickets to travel back and forth. I remember a number of birthday parties at the Ely Railway Workers Social Club - no alcohol of course, but the brand new rock ’n’ roll music made it a very exciting time. I spent a number of weekends in Ely with classmates Barry Scarborough and Ted Binge. I was born in Isleham, but we moved to Cambridge when I was 2. Through my many visits staying with my grandmother in Isleham, I developed a love for the red and black uniform worn by Isleham boys, Colin Cresswell, Andrew Folkes & Lawrence Wells. When I received a place at Soham, it was a dream come true. I loved my school uniform so much I often wore it on weekends - cap ’n’ all! The first time I wore it was when my dad took me to the Farnborough Air Show in 1955 - the weekend before I started at Soham! I was also very proud to wear the red and black football strip for the school 2nd Eleven. 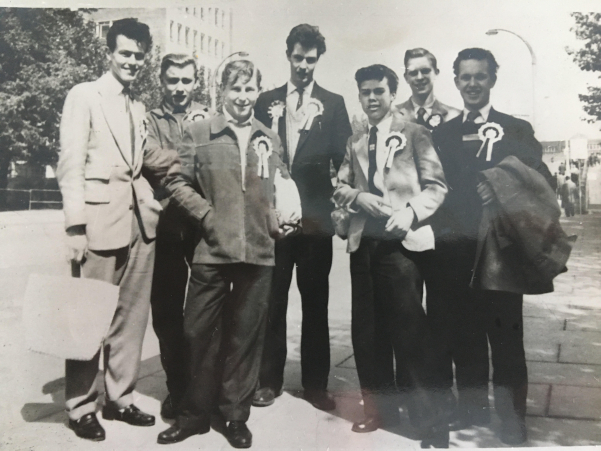 In 1959, a group of us wagged off school on sports day and went to see England play Italy at Wembley, for which we duly received the cane from headmaster Armitage (I have a group photograph taken outside Wembley stadium). Even though I didn’t do very well academically, I enjoyed my time at Soham - and I still have my red and black school scarf. At Wembley Stadium on 6th May 1959 before watching England draw 2-2 with Italy. L-R: Vince Driver (55) - 2 - Michael Clark (55) - Lofty Ward - Chris Gaulty - David Banyard (55) - John Perkins. I left Soham after Fifth form, in 1960, without qualifications, without ambition or any sense of purpose and direction. But when Jesus entered my life at the age of 38 everything changed; suddenly I had a much clearer sense of purpose & direction. To cut a long story short, my wife and I came to Australia in 1988, with a very strong call to missionary work in Indonesia. In preparation, I spent four years at Morling Theological College in Sydney; that was quite a challenge, but I came away with four qualifications, including ordination. After learning the language in Bandung, we served for two years in the highlands of Irian Jaya (New Guinea). Unfortunately, political conflict forced us back to Australia prematurely in September 2000. That was quite an adventure. We have now been living in Australia for 30 years, almost half that time on the Gold Coast.